The new pavilion at Dickinson Oval in Bermagui was officially opened on Saturday 18 July by Member for Bega, Andrew Constance, and Bega Valley Shire Mayor, Michael Britten. The pavilion replaces a building that was destroyed by fire in 2012 and has been built with support of the NSW Government Community Building Partnership Program and the Bega Valley Shire Council. Cr Britten said the pavilion rebuilding is a fantastic result for the community. “In rebuilding, the opportunity was taken to provide upgraded facilities that will meet the current and future needs of the Bermagui community,” he said. Mr Constance congratulated the Sportsground Management Committee and said he was pleased to see the facilities being enjoyed by the community. 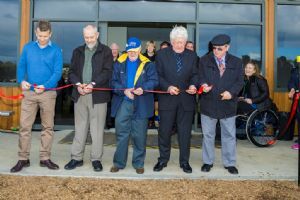 The ribbon was cut by Mr Constance, Cr Britten and three long time members of the local sporting community - Brian Lewin representing cricket, Clyde Watt representing Rugby Union and Des Farell representing AFL. Also present Councillors Liz Seckold, Russell Fitzpatrick, Kristy McBain, Tony Allen and Sharon Tapscott, General Manager, Leanne Barnes, Group Manager Community, Relations and Leisure, Anthony Basford, representatives of the sportsground management committee, sporting teams and members of the community. Secretary of the Sportsground Management Committee, Ged Nash, thanked the NSW Government and Council and especially Council’s leisure and recreation project engineer, Richard Cunningham, for their support and guidance through the whole process. 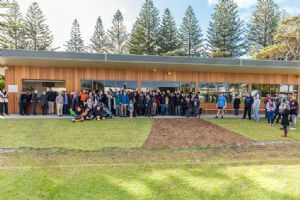 The ceremony was held in conjunction with a home game for the Bermagui Breakers AFL team and the new facilities withstood the trial run with ease. The year ahead will bring cricket teams, Sapphire Coast Kennel and Obedience Club and the Seaside Fair to use the new pavilion and other groups are expected to sign up. Photograph 1: Everyone was very happy to see the pavilion officially opened. Photograph 2: Minister Andrew Constance, Brian Lewin, Des Farell, Clyde Watt and Mayor Michael Britten cutting the ribbon at the opening.